This is a bit of a long post, as I've been using some new hair products that I wanted to talk about, which then somehow turned into a FOTD post as I had my makeup freshly applied when I started taking hair photos, and voila, a long rambling hair and makeup post! First things first, I'm still using coconut oil as a deep nourishing treatment on my hair about once a fortnight. Read all about it HERE. My hair is honestly in the best condition it's been in a while, and all thanks to this natural ingredient. Now to the rest of the hair stuff. I recently dyed my hair with a new hair dye I hadn't tried before. I always dye my own hair as modern day hair dyes are so easy to use I can't justify spending $$$ at the salon when all I'm after is to deepen my natural hair colour slightly, and hide greys! Yes, greys! 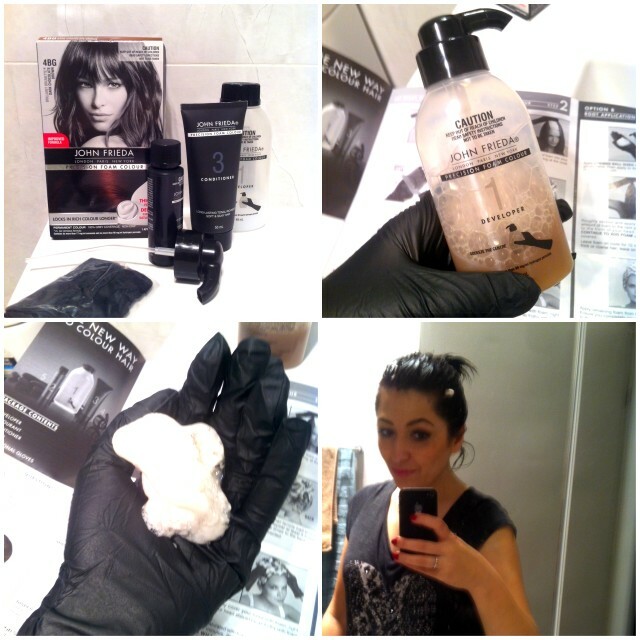 The one I tried this time was the John Frieda Precision Foam Colour in Dark Chocolate Brown* (AUD $22.99). It's a foam colorant which claims to give professional salon quality results at home. It's very easy to use, simply add the colour to the developer, mix, then apply to dry unwashed hair. The applicator bottle took a while to get the hang of though - I kept wanting to press down on the top bit for the foam to come out, but you're instead meant to squeeze the bottle not press down on the pump. Never mind, no biggie. After application I left it on my hair for 25mins (slightly longer on my roots), then rinsed well and finished with the included conditioner. In terms of ease of use, the mousse colorants are probably the easiest to use as you get no drips what so ever. Also what I liked about it is it didn't stain my hairline. Did it fully mask all my greys? Sadly, no. It did make my hair very glossy, with a deep chocolate shine but majority of my greys remained. It could be that I didn't leave it on long enough, so I'll probably give this dye another go as I love the colour and the shine it left. Excuse the blurry iPhone pics - I took the photos in the bathroom and there was no way I was taking a camera in there as knowing me I'd drop it on the tiles and break it! See, newly dyed but grey hair remains! Part of the reason my hair was in such bad condition before is because I used heated appliances on it almost everyday, either a straightener or curler. Well, when I read about the Tresemme 7 Day Keratin Smooth* range I was keen to try it, as it claims to make your hair smooth for up to 7 days, even through washes. This range comes with a shampoo, conditioner and a heat activated treatment. You just wash/condition your hair as per normal with this range, then apply the treatment just before you blow dry/straighten it. It's designed to work with heat. I will tell you, if you just wash it then let it air dry it won't make your hair smooth and frizz free. I know, I tried it. You actually have to use it with a dryer or straighter to see the effect. Not only does the treatment protect your hair from heat, it also makes the straightening process quicker, and what you're left with is smooth shiny hair. Now I can't tell you how effective it is at keeping hair smooth for 7 days because I never went that long without washing. Overall I quite enjoyed using this range. I've already finished up the shampoo and conditioner, but I'm still using the leave-in heat activated treatment after each wash to protect and smooth my hair. Phew, this was a long post! If you made it this far, thank you! Hope you enjoyed my ramblings. I need to get back in the habit of doing a coconut oil deep treatment. It did do wonders for my hair too with regular use.